Radicchio—Many think this is a vegetable new to them, but if you’ve ever had a mixed bag of salad with those crisp purple and white crunchy leaves that look like cabbage, then you’ve eaten radicchio. We grow two types, green, which is slender and looks like a romaine lettuce, or purple, which are round and look like tiny cabbages. It’s considered a “bitter green,” though I wouldn’t exactly call them bitter like the dandelion greens. They’re more subtle. Of course this crop can be used in a salad, but for a great way to enjoy the flavor of this crop, try it grilled! Quarter the plant and brush with olive oil and salt. Grill until wilted and the edges are just a bit charred. Radish—small shares received French breakfast radishes, large shares received Easter egg radishes. Try roasting your radishes or sauteeing them with their tops with butter and lemon juice. 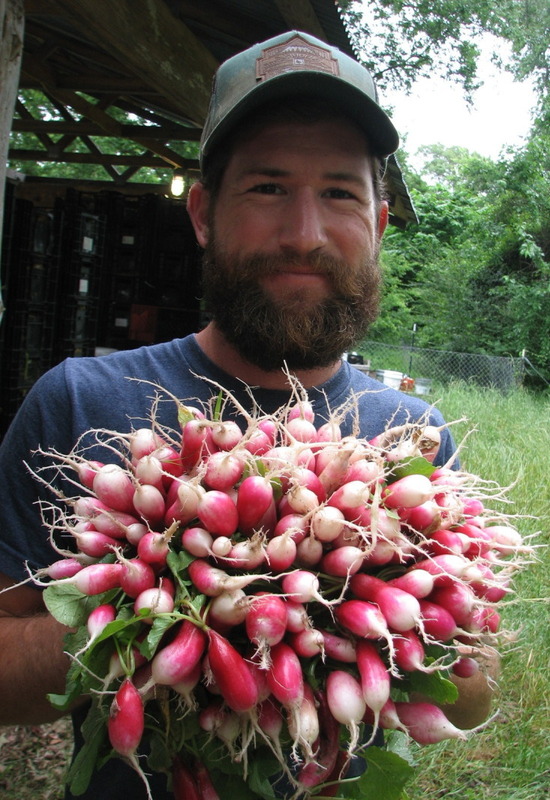 Have you tried our simple pickled radish recipe that we served at our Farm Dinner? Kale—Large shares received curly kale, and the small shares received Red Russian kale. Try one of our many kale recipes in the kitchen blog. Arugula—small shares received spicy delicious arugula. serve in a salad with feta and fresh blueberries. It’s delicious! Onions—We began our (really huge) onion harvest this week a littler earlier than in a usual year but they are healthy and delicious. Each share received two of our sweet yellow variety and there will be many more to come. These are young, uncured onions, so they should be eaten fresh, and not stored away for days on end. Use within a week. 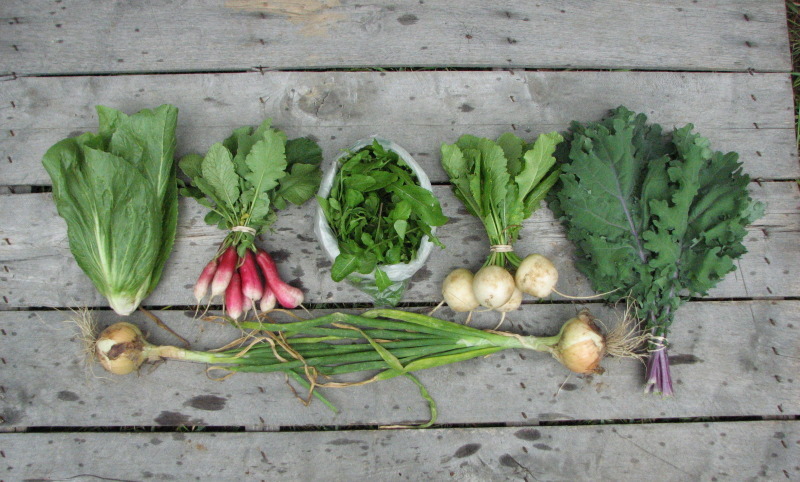 Turnips—Each share received one of our two varieties. Scarlet Queen turnips, are our lovely rose colored turnip with white centers. Hakurei turnips are our crisp, white salad turnip, that is excellent raw. like a mild, large radish. If you’re not a turnip fan, try these! Unfamiliar with turnips? Try this roasted salad recipe or this crisp, delicious root salad recipe. 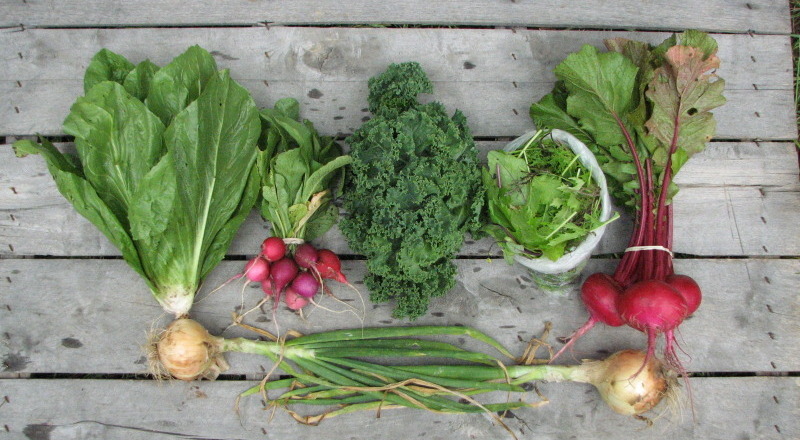 Large Share: radicchio, Easter egg radish, curly kale, Asian spring mix, scarlet queen turnips, sweet yellow onions. Small share: radicchio, French breakfast radish, arugula, Hakurei salad turnips, Red Russian kale, and sweet yellow onions. I sauteed my white turnips, turnip greens, and radish tops with olive oil, garlic, sea salt and powder. Awesome!